Yes, you can generate HAP ID for medical before you submit or lodge your 189 or 190 visa application. You can even get health checks done before getting invited. Start My Health Declarations as it is mandatory in order to generate HAP ID. 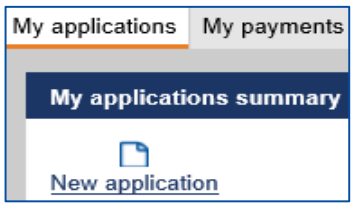 Once you have logged in, click ‘New application’. 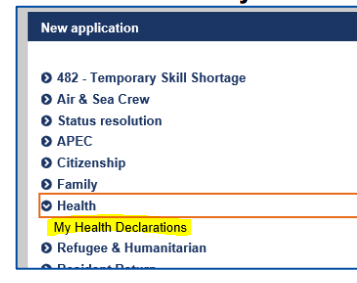 Then click the Health -> My Health Declarations option to open a new health declarations wizard. Accept Terms and conditions and click Next. Select the visa that you intend to apply.For visa 190, there is no option here. So, you probably cannot generate HAP ID for 190 visa unless you get an invitation.As a matter of fact, your 189 visa medical check up will work for 190 visa too. If you expect or have received 189 invitation, choose 189 or any other visa as applicable. • Details of any visa label numbers for any previous Australian visas. For each accompanying family member, you need to click on the Add button and provide their personal details on the new page that displays and then click the Confirm button.After you click on the Confirm button, the family member will be added to the list on the accompanying family members page of the form. When you have finished, click on the Next button.This is important to generate HAP ID for each family member. For each family member that you added in last step, you need to provide their travel history. If you select Yes to question about intentions to apply for the permanent stay in Australia within the next 6-12 months, an additional question will display asking whether you wish to have your health assessed for a permanent stay in Australia, that is complete health examinations for a permanent stay level. If you applying for 189 or 190 visa, you should select YES. application) in order for Australian immigration to determine which health examinations (if any) you are required to complete. Note: When you lodge your visa application you will be asked to complete these questions again in case your answers/circumstances have changed since recording them on your My Health Declarations form. You must agree to each declaration before clicking on the Next button. All the information that you have entered on My Health Declarations form will appear on the review page for you to review.Please check that all the information provided is correct before proceeding as you will be unable to change your answers once the Submit Application button has been pressed. Once you are done with wizard, you need to generate the HAP ID referral letter for Doctor’s appointment. Click on the Health assessment link on the left side of the application page (in your immiaccount). Click Actions -> Organise health examinations link for each applicant separately. The Organise health examinations link will take you to complete your medical history online and generate a referral letter to complete your immigration health. Be careful while selecting your health declaration answers as a mistake may prompt you to get the checks done again at your cost. It will also delay the processing of your health examinations and subsequently your visa application. Should I get medical check done before lodging Visa application? It is recommended by Australia immigration to get your medical before submitting your visa application to save on processing time. Thanks to your post, I was able to generate HAP IDs for my family. Our invitation to apply will expire in 9 May and we will still have to schedule our Medical Examinations this coming Monday. So far my application is already in “Ready to Submit” state, but I have selected “Yes” in the question about having the medical examination done in the past 12 months and just indicated “AWAITING RESULTS” in the details, just to link the HAP ID I generated manually. Is it OK to submit our application now even if we are yet to have the checkup done? I’m getting pretty nervous about the deadline since it’s so close. Normally, the process is to pay fees and submit the application and then generate HAP IDs. So, you can submit your application. my partner got invited for 190 and we are gathering all documents for lodgment at the moment. We are preferably aiming for a direct grant so want to have everything ready and submit all together. However, like you say there’s no option for 190 visa so should we just tick 189 and do it under this visa type? We don’t want any delays and not sure if this wouldn’t be an issue? Please advice based on your experience, thank you. My suggestion is to upload all documents in immiaccount, pay fees and then generate HAP ID for your 190 visa application. This is the fastest way for your case. Panel physician has uploaded my spouse’s health assessment status in ImmiAccount and it’s showing ‘Examinations ready for assessment – no action required’ instead of ‘Health clearance provided – no action required’. Is this normal.. ? This is normal. No need to worry. Hi, I have got he invite and I clicked on Apply for VISA. Is it ok to create new application to generate HAP ID for medical test or follow the existing application and do the medicals after submitting the visa application. Please guide. It is better to do the medicals after submitting the visa application. Do NOT create a new immiaccount just for medicals after getting invite. You should use the same immiaccount for medical and visa invite submission. I am having same problem when generating referral letter and it says “Your request cannot be processed at this time. Please try again later. I have to provide medical examination for my son and trying since 4-5 days but same message is getting displayed. Can I do that medical examination done without HAP ID as it was done long time ago without HAP ID? what if case officer decide application without result of health examination in this case? will case officer blame us or system and provide us some alternate? You cannot do medical without HAP ID. You should contact the immaccount support. Thanks for replying , I would definitely contact immi account support. Are you migration agent or consultant if u don’t mind? I have given my passport for renewal and waiting for the same. Meanwhile , i am thinking to get my wife’s medical done. So two questions here. 1. Can I create only my wife’s HAPID? If yes how? 2. If no for 1st question , can I use my old passport details for generating her HAPId to get her medical , and then with my new passport can I create HAPID and do my medical later. Use new and valid passport details to do anything that affects your Australia PR application. I have undergone the medical tests required after hap id generation and the status of health assessment has been changed to “Health clearance provided – no action required”. Now I need to generate a pdf of health certificate from here but I can’t find any link. Can you help me with this? Why do you need a PDF file for health results? There is no option to see or get your Health reports. I clicked “organise health examination”, then it sent me “your request cannot be processed at this time. please try again later.” is that normal? What should i do? It must be a temporary system maintenance issue. You can try again. While generating HAPID, noticed below note in the immiaccount : Note: The department will not provide this person with advice regarding health examination results until they have lodged a visa application. Does this mean we can get the results of the medical only after placing the visa application? The results are not shared to you by doctor. They are uploaded directly to immiaccount and you cannot view them. What the message means is that there will be no evaluation of your medical results by immigration case officer until you have lodged your visa application.